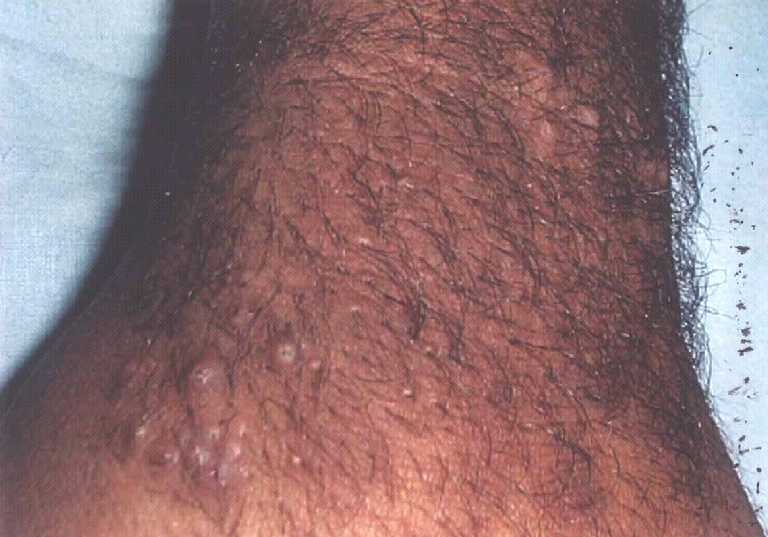 A 19-year-old male presented with a single congenital firm dark plaque on the left forearm, covered by dark thick hairs with prominent perifollicular papules. Histopathological examination revealed intersecting bundles of smooth muscle fibers oriented haphazardly in various directions. The relationship of congenital smooth muscle hamartoma and Becker's melanosis is discussed. Congenital smooth muscle hamartoma (CSMH) is a distinct clinicopathological entity, first described by Stokes and colleagues at the beginning of the twentieth century. It presents at birth as a skin-colored or slightly hyperpigmented patch or plaque with prominent vellus hair . In older patients, it may become more hyperpigmented. The number of hairs on the lesion is not increased, but the hairs appear to be more prominent because of the increase in their length and/or diameter . Transient elevation and induration induced by rubbing may be noticed [pseudo Darier's sign] . Occasionally, CSMH is diffuse, with generalized hypertrichosis and folding of the skin, producing the so-called Michelin tyre baby syndrome. In this situation, other malformations and chromosomal abnormalities have been reported . A 19-year-old young man presented with a single firm dark slightly elevated plaque on the extensor surface of his left forearm. The lesion had been present since birth, though much lighter in color and was covered by prominent, lightly pigmented vellus hairs. It slowly enlarged as he grew up, but since puberty it started to become more hyperpigmented; hairs within the lesion become darker and thicker than hairs of the surrounding uninvolved skin, with prominent perifollicular papules especially noted at the edge of the lesion. Temporary elevation and induration is noted by the patient after vigorous rubbing or itching, otherwise it was asymptomatic. Clinical differential diagnosis included: pigmented hairy naevocellular naevus, Becker's melanosis, hyperpigmentation and hypertrichosis due to prolonged use of potent topical steroids, and smooth muscle hamartoma. Histopathological examination revealed moderate acanthosis, some elongation or the rete ridges, and basal cell hypermelanosis. In the dermis there were numerous scattered discrete groups of cells, arranged in fascicles, extending down to the reticular dermis, with some of their nuclei being round while others were fusiform with blunt edges. These groups of cells were surrounded by ample amount of dermal collagen, with clear spaces separating them from the surrounding collagen fibers. The groups of cells were intersecting bundles of smooth muscle fibers oriented haphazardly in various directions as shown by Masson trichrome stain, which stains muscle fibers red, and collagen fibers green. Diagnosis thus was congenital smooth muscle hamartoma. Retiform hemangioendothelioma: multiple lesions on the scalp. H&E: Sattered discrete groups of cells, arranged in fascicles, extending down to the reticular dermis, their nuclei being round while others were fusiform with blunt edges. They are surrounded by ample amount of dermal collagen, with clear spaces separating them from the surrounding collagen fibers. A hamartoma, literally means a mass of tissues gone wrong, denotes a circumscribed malformation characterized by an abnormal mixture of non-neoplastic tissue elements, with excess or deficiency of one or more of them in a given organ. In the skin, hamartomatous development of the epidermis, appendages, dermis, and/or subcutaneous tissue may occur. In 1949, when Becker described his first two cases of localized unilateral hyperpigmented hypertrichotic macules on the shoulders of two adolescent males acquired during puberty, abnormal smooth muscle elements were not then described . Other authors have reported patients with congenital lesions having a gross appearance more or less similar to the acquired lesions described by Becker, but with the additional observations that they were firm, had prominent perifollicular elevations, and had increased smooth muscle bundles in the dermis. In addition, lesions combining both features with varying proportions of either of them have been repeatedly described . In an attempt to explain such an overlap, it was suggested that Becker's melanosis might be representing one end of a spectrum of a combined hamartoma consisting of epidermal (acanthosis), melanotic (hyperpigmentation), pilar (hypertrichosis), and dermal (smooth muscle) elements, while lesions with principally smooth muscle abnormalities may represent the other end of the spectrum . That is to say that, in Becker's Melanosis, hyperpigmentation and coarse hair are the dominant features (epidermal changes predominate), while in smooth muscle hamartomas, the dominant feature is a proliferation of smooth muscles (dermal changes predominate). Lesions intermediate between "pure" Becker's melanosis and "pure" smooth muscle hamartomas may show varying degrees of pigmentation, changes in the diameter and/or number of hairs, and smooth muscle proliferation . The cause of the congenital smooth muscle hamartoma is thought to be due to excessive production of smooth muscle at the time of maturation of the mesoderm during foetal life . Exquisite androgen sensitivity and stimulation due to increased androgen receptors within the Becker's melanosis is now proved to be the cause of such a disorder . This is logically expected, as most of the clinical characteristics of Becker's melanosis are the well-known manifestations of androgen stimulation of the skin (hyperpigmentation, hypertrichosis, acanthosis, and dermal thickening). In addition to its onset at or shortly after puberty predominantly in male patients. 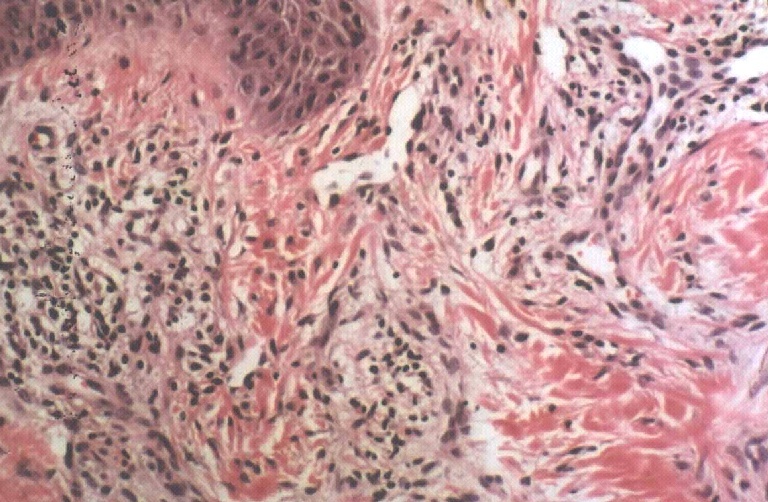 Smooth muscle hamartoma is histologically different from piloleiomyoma, which forms large aggregates of poorly marked, ill-defined, interlacing bundles of smooth muscle interspersed with collagen, in contrast with the well-defined distinct smooth muscle bundles of smooth muscle hamartoma, that are surrounded by ample collagen . Clinically leiomyomas appear as discrete tender reddish nodules. Treatment is not necessary, as it never undergoes malignant changes  but if desired for cosmetic reasons, the hypertrichosis could be cleared by epilative procedures. Surgical excision is elective. 1. Johnson MD, Jacobs AH: Congenital smooth muscle hamartoma. A report of 6 cases and a review of the literature. Arch Dermatol 1989; 125: 820-2. 2. Darling TN, Kamino H, Murray JC: Acquired cutaneous smooth muscle hamartoma. J Am Acad Dermatol 1993; 28: 844-5. 3. Berger TG, Levin MW: Congenital smooth muscle hamartoma. J Am Acad Dermatol 1984; 11:709-12. 4. Schnur RE, Herzberg AJ, Spinner N, Kant JA, Magnusson M, McDonald-Mcginn D, Rehberg K, Honig PJ, Kankai EH: Variability in the Michelin tire syndrome. J Am Acad Dermatol 1993; 28: 364-70. 5. Slifman NR, Harrist TJ, Rhodes AR: Congenital arrector pili hamartoma. Arch Dermatol 1985; 121:1034-7. 6. Bronson DM, Fretzin DF, Farrell LN: Congenital pilar and smooth muscle naevus. J Am Acad Dermatol 1983; 8:111-4..
7. Dupre A, Viraben R: Congenital smooth muscle naevus with follicular spotted appearance. J Am Acad Dermatol 1985; 13:837. 8. Person JR, Longcope C: Becker's naevus: An androgen-mediated hyperplasia with increased androgen receptors. J Am Acad Dermatol 1984; 10: 235-8. 9. Metzker A, Merlob P: Congenital smooth muscle hamartoma. J Am Acad Dermatol 1986; 14:691.